INSIDE / OUT is a 2-artist exhibition of sophisticated video installations. Artists Christopher Flower (Montréal) and Jasper van den Brink (Amsterdam, Netherlands) present unique and complimentary aspects of video installation, with a particular focus on how the camera is used to capture an image and how the presentation of an image can alter perception. 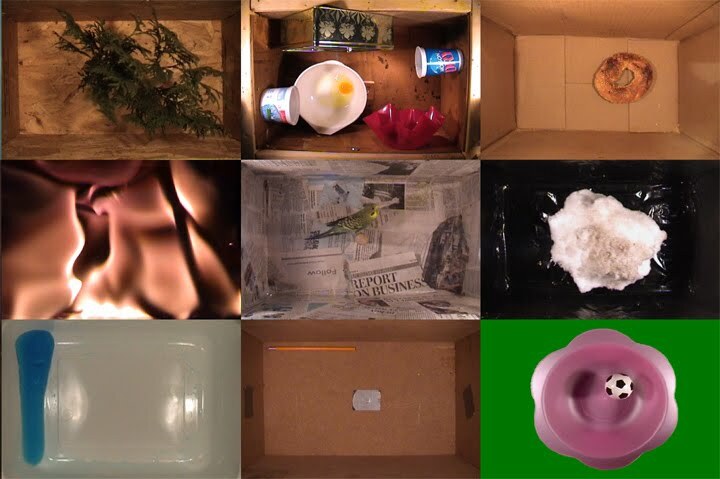 Christopher Flower produces videos with the aid of boxes and various banal household objects. His technique effectively disguises our traditional up/down, left/right methodology of reading a video image. These are autonomous worlds-within-worlds, the various household objects creating playful narratives or formal structures that probe physical improbabilities. Using a deceptively simple technique, Flower attaches a box over the lens of his video camera, effectively creating a solid-seeming backdrop to his videos that one assumes would correspond to known laws of nature. Of course, by simply manipulating the box, he changes the momentum and course of action for a variety of household objects placed inside. Since the box doesn’t appear to move, he effectively animates these objects. In one video, a hapless banana is pursued and eventually crushed by a brick. In another, a can of Diet Coke is impaled and suffers death throes at the point of a nail. The installation at Third Space Gallery is similar to another created in 2005 at YYZ in Toronto, where Flower transformed a gallery into a cave, complete with monitors on the floor and suspended from the ceiling, placing the visitors to the exhibition in a similarly disorienting space as his bananas, straws and pencils. At Third Space, with the use of a large projected image, Flower literally places the viewer in the box—the “white cube” becomes another of his boxes. The cave motif emerges again with the use of the small projects room and vault, where smaller monitors rest in unusual positions, on the floor, wall and ceiling. The video works of Christopher Flower are highly inventive and engaging. They create a sense of of vertigo and joyous bewilderment in the viewer, as we imbue pencils, bananas, bricks and water with a larger sense of purpose and grander narrative as they appear to defy gravity and move about the picture plane as if by magic. In a formal sense, some of the videos simply use colour, pattern and composition to explore the flatness and rectangular shape of the screen. With an economy of means Flower makes video that is seductive, engaging and considered. Jasper van den Brink spent much of the month of August as Third Space Gallery Artist-in-Residence, offering workshops and screenings while creating new work. His presence was made known in the city: he gave numerous workshops, showed his film and the work of other Dutch artists, and quickly became part of the community. Van den Brink is interested in exploring the ways in which an image can alter perception by modifying its presentation. His contribution to INSIDE / OUT is a video installation titled Self-Portrait, which was presented in the Library Gallery of the Saint John Arts Centre. Van den Brink’s work has been described as a “quasi-scientific investigation into problems that do not necessarily need to be solved”. For the past number of years, he has worked with dynamic projected video images (Fly, Pole Vaulters) that actually move around in space by way of motorized mirrors set up in front of the projector lens. He is interested in how a camera and the projection of an image can move or remain static. 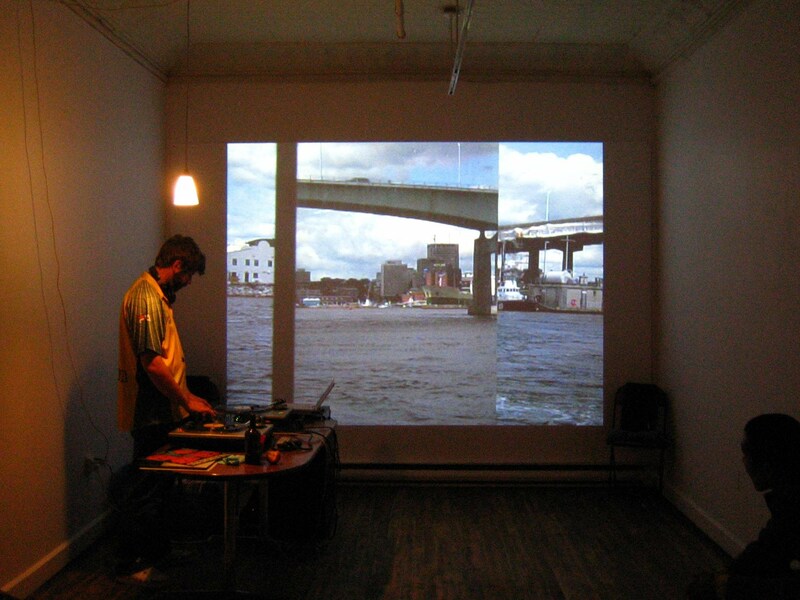 To create videos with a moving projection, he utilizes sound encoded on the audio tracks to synchronize recording and playback. Hence, a motorized mirror can “remember” how it was moving during recording, and re-create the same motions in the projection. In Self-Portrait the mechanics are even more complex and involve a customized car complete with track and chain, which carries the dvd player and projector, equipped with a timed focus. All these gears and motors contribute to a video installation that reaches beyond its pictorial boundaries to literally “draw in” the viewer. The video of Self-Portrait opens wide on the screen in the gallery, with the projector at the very back of the room. The image appears to be the canopy of a forest as seen from a bird’s eye view. But the flowing green is actually the algae in the water of the Ijsel Meer, the largest lake in Holland. A tiny speck of a boat is soon spotted, with a white cord leading towards the viewer (it is in fact attached to the helium-filled balloon holding the camera up in the sky). The car and projector slowly but steadily advance on a white track, which mimics the white cord in the video. As the projector advances, the image shrinks: the boat becomes clearer and larger within the frame. It soon becomes clear that what the artist is doing is reeling in the video camera and, by extension, the projector, and by further extension, the viewer. Self-Portrait merges conception, process and reception together into one tidy, self-referential package. As such, it is indeed a portrait of the artist. But the video itself is also a self-portrait: It reveals itself and replays its own making. This moment of literal creation presents the artist as both author and as subject. 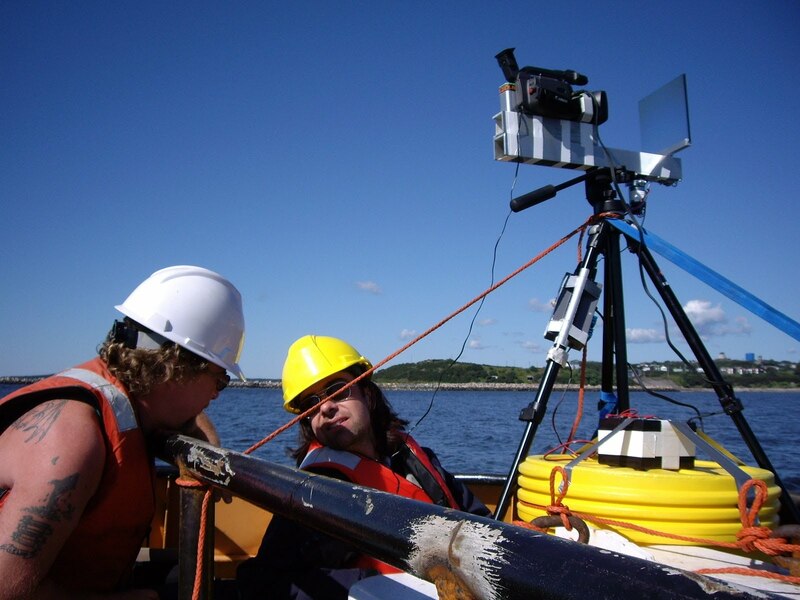 While in Saint John, Van den Brink was also granted the opportunity to tour the expansive harbour with a motorized mirror mounted to a customized tripod on the back of a small tug and in order to videotape new footage. A new work will be created with this footage that will present a portrait of sorts of Saint John at various European venues, furthering a most interesting exchange. Christopher Flower received his BFA from the University of Lethbridge in 2000 and his MFA from Concordia University in 2003. He has exhibited his work at YYZ in Toronto, the New Gallery in Calgary and at various galleries and off-site locations in Montréal. He has received Production Grants from the Conseil des arts et des lettres du Québec in 2004 and the Centre Interuniversitaire des Arts Médiatiques in 2003. He lives and works in Montréal, except when tree-planting in Saskatchewan. Jasper Van den Brink studied from 1991 to 1996 at the Gerrit Rietveld Art Academie Amsterdam and in 1994 at The School of the Chicago Art Institute. He exhibits regularly across Europe and has been commissioned to make work for the Dutch Government (2006, Dutch Flag ), the Ministry of Finance ( Special Euro Coin ), the DVD Big Art for Children (2005, Bouncing Balls ) and Mediamatic (2004 Tunnel Vision ). In 2002 he was awarded the 2 nd position of the Prix de Rome in the Film & Video category for his work Self Portrait. INSIDE / OUT was made possible with funding from the Canada Council for the Arts, NB Arts Development, Arts NB, the Dutch Embassy of Canada and Kent Lines International, with additional support from the Telegraph Journal, Avis Car Rentals, Avant-Garde Construction, Hit!Media, Continental Drift Film Festival, Punch Productions, T4G, Picaroons Brewery and the Saint John Arts Centre.